YellowAirplane.com: P-51 Mustang WWII Military Model Airplanes, P51 1/48 Scale, 1/32 Scale Diecast Fighter Airplane Models. P-51 Mustang WWII Military Model Airplanes, P51 1/48 Scale, 1/32 Scale Diecast and Mahogany Fighter Airplane Models. P-51 1/48, 1/32 Scale Die Cast Model Airplanes. P-51 Diecast Model Airplanes 1/48 Scale 1:32 Scale Diecast Scale. Super Detailed Diecast airplane models of the WWII P51 Mustang come in 1:48 Scale and 1:32 Scale Diecast Display Models. of the World War II Fighter Department. WWII Military Propeller Aircraft, the North American P-51 Mustang Model Airplane Models, P51 DieCast Models, Model Airplanes. These Diecast and Mahogany Display Model Airplanes come in 1/48, 1/32 Scale Models. 1:48, 1:32 Scale Aircraft. P-51 Mustang Diecast Model Planes. Made of Philippine mahogany, this hand carved, 1/36 scale model beautifully replicates the P-51D Mustang "Miss Ruth," which was flown in the Mediterranean Theater of World War II by the 4th Fighter Squadron, 52nd Fighter Group. Measuring 10" long with a 12" wingspan, it includes a display stand with a mahogany base and a history plate. Meticulously hand carved and painted by expert craftsmen, this premium quality, 1/35 scale, mahogany model of a P-51D Mustang flown by the 322nd Fighter Group "Tuskegee Airmen" includes an elegant wood display base with a history plate. 12" wingspan; arrives ready to display. Made of Philippine mahogany, this 1/24 scale model measures 18¼"" in length and has a wingspan of 18¼". Hand painted and detailed with the markings of the Tuskegee Airmen, model comes ready to display on the included mahogany base. Hobby Supply Center. A replica of "Detroit Miss," the famous P-51D Mustang flown by 6-victory ace 1st Lt. Urban Drew of the 375th Fighter Squadron, 361st Fighter Group "Yellowjackets," when he was based at RAF Little Walden in1944-45, this 1/48 scale, die cast Hobby Master model features engraved panel lines; a fully outfitted cockpit with a sliding canopy and a removable pilot figure; movable wing flaps, an opening rear coolant scoop, and a rotating propeller; removable drop tanks and bombs; optional-position landing gear; and authentic markings, including nose art and victory symbols below the canopy. 9" wingspan; arrives ready to display on the included stand. A rare opportunity to acquire a model hand-signed by a World War II ace, this 1/48 scale, die cast Hobby Master model of "Detroit Miss" - the famous P-51D Mustang flown by 6-victory ace 1st Lt. Urban Drew of the 375th Fighter Squadron, 361st Fighter Group "Yellowjackets," when he was based at RAF Little Walden in1944-45 - includes a display stand with a metal nameplate signed by 1st Lt. Drew! And that's just the beginning, because this fully-loaded model has all the great quality and detail you've come to expect from Hobby Master: engraved panel lines; a fully outfitted cockpit with a sliding canopy and a removable pilot figure; movable wing flaps, an opening rear coolant scoop, and a rotating propeller; removable drop tanks and bombs; optional-position landing gear; authentic markings, including nose art and victory symbols below the canopy; and more. 9" wingspan; limited to only 520 worldwide. This amazingly detailed, limited edition, 1/48 scale, die cast model of the Mustang Mk.III flown by 16-victory ace Eugeniusz Horbaczewski - the commander of RAF No. 315 (City of Deblin) Polish Fighter Squadron in 1944 - is a real beauty! It features engraved panel lines, a fully outfitted cockpit with an opening canopy and a figure of Horbaczewski, cowl panels that can be removed to reveal a detailed engine, movable flight control surfaces, wing-mounted fuel tanks, removable 500-pound bombs, optional-position landing gear with real rubber tires, authentic markings, a display stand, and more. 8" wingspan. Part of the Smithsonian Museum Replica Series, this value d, 1/48 scale, die cast model of the P-51 Mustang "Big Beautiful Doll" flown by 14-victory ace Col. John Landers - the commanding officer of the 78th Fighter Group - features textured surfaces, a glazed canopy, a rotating propeller, authentic markings, a P-51 collector's card, and more. 9" wingspan; includes a display stand. Hobby Master's second Signature Edition Mustang, we expect this one to sell out as quickly as the first! A fabulous 1/48 scale, die cast model of "Jersey Jerk" - the famous P-51D Mustang flown by 13 -victory ace Donald Strait of the 361st Fighter Squadron, 356th Fighter Group, when it was based at RAF Martlesham Heath from 1943-45 - includes a metal display stand nameplate that has been hand signed by Maj. Strait himself! And that's just the beginning, because this fully-loaded model has all the great quality and detail you've come to expect from Hobby Master: engraved panel lines; a fully outfitted cockpit with a sliding canopy and a removable pilot figure; movable wing flaps, an opening rear coolant scoop, and a rotating propeller; two styles of removable drop tanks; optional-position landing gear; and authentic markings, including the squadron's colorful diamond pattern on the engine cowling. 9" wingspan; limited to only 500 worldwide. A rare opportunity to acquire a model hand-signed by one of World War II's "Tuskegee Airmen," this 1/48 scale, die cast Hobby Master model of "Bunnie," the famous P-51D Mustang flown out of Ramitelli Airfield, Italy, by Capt. Roscoe Brown, Jr., (one of only 15 pilots to shoot down a German Me 262 jet fighter) of the 100th Fighter Squadron, 332nd Fighter Group, in early 1945 includes a metal display stand nameplate signed by Capt. Brown himself! And that's just the beginning, because this fully-loaded model has all the great quality and detail you've come to expect from Hobby Master: engraved panel lines; a fully outfitted cockpit with a sliding canopy and a removable pilot figure; movable wing flaps, an opening rear coolant scoop, and a rotating propeller; removable drop tanks and bombs; optional-position landing gear; authentic markings, including victory symbols below the canopy; and more. Limited to only 500 pieces worldwide, this model has a 9" wingspan and arrives ready to display. A replica of "Bunnie," the famous P-51D Mustang flown out of Ramitelli Airfield, Italy, by Capt. Roscoe Brown, Jr., (one of only 15 pilots to shoot down a German Me 262 jet fighter) of the 100th Fighter Squadron, 332nd Fighter Group "Tuskegee Airmen," in early 1945, this 1/48 scale, die cast Hobby Master model features engraved panel lines; a fully outfitted cockpit with a sliding canopy and a removable pilot figure; movable wing flaps, an opening rear coolant scoop, and a rotating propeller; removable drop tanks and bombs; optional-position landing gear; and authentic markings, including victory symbols below the canopy. 9" wingspan; arrives ready to display on the included stand. a P-51D Mustang flown by the Royal Netherlands East Indies Army Air Force's No. 120 Squadron against Indonesian Nationalists during the Indonesian War of Independence in 1947-49 (the war ended Dutch rule in Indonesia), this 1/48 scale, die cast Hobby Master model will make an impressive addition to your collection! A much better picture of this airplane on this page. You get a detailed cockpit with a sliding canopy and a removable pilot figure; movable wing flaps, an opening rear coolant scoop, and a rotating propeller; two styles of removable drop tanks; optional-position landing gear; and authentic markings, including RNLAF roundels on the fuselage. 9" wingspan; includes a display stand. This amazingly detailed, limited edition, 1/48 scale, die cast model of a 51st Fighter Group P-51B Mustang flown by 18-victory ace David Lee "Tex" Hill of the 75th Fighter Squadron, 23rd Fighter Group, in 1944 is a real beauty! It features engraved panel lines, a fully outfitted cockpit with an opening canopy and a figure of Hill, cowl panels that can be removed to reveal a detailed engine, movable flight control surfaces, wing-mounted fuel tanks, removable 500-pound bombs and bazooka rocket tubes, optional-position landing gear with real rubber tires, authentic markings including shark's mouth nose art, a display stand, and more. 9" wingspan. the original, two-door "Pony Car" named after the P-51 Mustang fighter, this 1/18 scale die cast and plastic model features a hood that opens to reveal a detailed V8 engine, an opening trunk with a spare tire, opening doors, a detailed interior, a glazed windshield, free-rolling rubber tires with steerable front wheels, and more. Measures 10" long and arrives ready to display on the included plastic base. P-51D Mustang 402 "City of Winnipeg" Squadron, Royal Canadian Air Force, a P-51D Mustang flown by No. 402 "City of Winnipeg" Squadron, Royal Canadian Air Force, when it was stationed at Stevenson Field in Winnipeg, Manitoba, in 1953. Lt. Col. Glenn Eagleston, 354th Fighter Group, 1945 "Feeble Eagle," the P-51D Mustang flown by 18-victory ace Lt. Col. Glenn Eagleston (who added two victories flying an F-86 Sabre in the Korean War) of the 353rd Fighter Squadron, 354th Fighter Group, in 1945. "Duchess Arlene," the P-51D Mustang flown by Lt. Robert Williams - who flew 50 combat missions from Italy during World War II and later wrote the original manuscript for the award-winning 1995 film, The Tuskegee Airmen - of the 100th Fighter Squadron, 332nd Fighter Group "Red Tails," in 1944-45. Major James H. Howard of the 354th Fighter Group single-handedly defends B-17s of the 401st Bombardment Group from numerous enemy fighter attacks, successfully saving the group and downing a number of German aircraft. Already an ace with the Flying Tigers in China, Howard received the Medal of Honor for his heroics that day, and he remained the only fighter pilot in the European theater to receive that award. The P-51 Mustang is probably the most famous of all of the Warbirds. This airplane was manufactured by North American Aviation during World War 2. The plane took only 90 days to design and became the worlds fastest propeller airplane, ever, setting all of the low altitude speed records for piston engine propeller driven airplanes even today. There are many of these airplanes still flying today at air shows everywhere. This plane is also a favorite at the Reno Air Races at Stead Field just north of Reno Nevada. Many Warbirds race at Reno every September. The P51 is 32' 3" long, 13' 8" high, and a wingspan of 37'. The Mustang weighs 7,000 lbs empty and has a max weight of 12,100 lbs. It used two different types of engines, the Allison and the Rolls Royce Merlin which produced 1,650 hp. The racing planes, by contrast, pump out over 4,500 hp. The P-51 Mustang had a max speed of 437 mph and a cruise speed of 275 mph. The P-82 was a twin fuselage version of the P-51, with two engines. The P-82 is also designated the F-82. 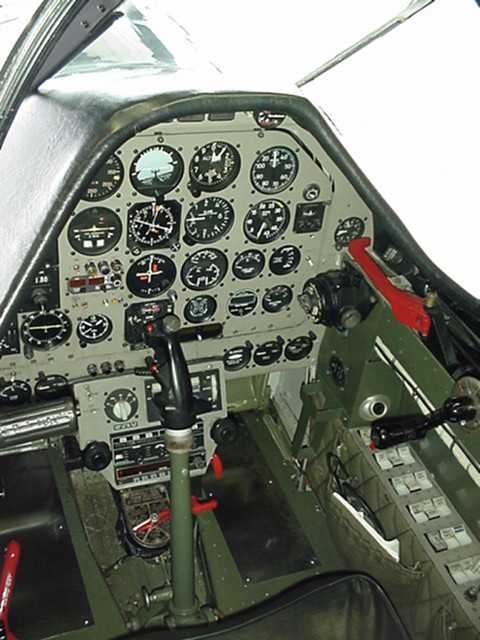 These model planes include die cast models, plastic model kits, and mahogany model planes.